TAUNTON, Mass. 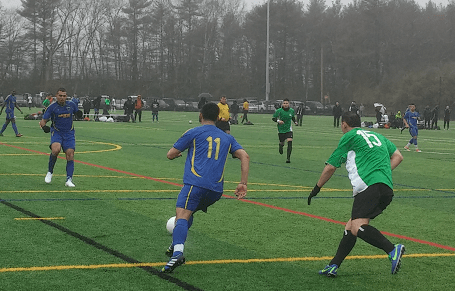 – Greater Lowell United FC secured a 3-1 win in their preseason opener against Mass United FC at Field 13 of the Forekicks Soccer Complex on Sunday. Lowell’s Ariel Lobo opened the account in the 20th minute, while Bryan Barrios equalized for the Riders in the 40th minute. Lowell pulled away in the second half through goals from Yaw Addow and Jhonny Valencia in the 50th and 79th minutes, respectively. The game was played on a fast, rain-slickened surface, and both teams attempted to use it to their advantage. But it was Lowell who found the board first when center back Carlos Monteiro played a long ball to Lobo, who ran onto it in the final third and slotted it through inside of 20 minutes. The action remained frantic through much of the first half, with Clement Obarisiagbon finding chances aplenty in the final third. However, it was from a free kick that the Riders would find its greatest fortune. With halftime approaching, Roman Ducotterd sent it far post for Barrios, who pushed it through from the doorstep to level the raw and soggy affair. After the briefest of intervals, the sides returned to the pitch in search of the go-ahead. And this time, Lowell would use a set piece to its advantage five minutes into the second stanza. Matthew Sequeira found Addow inside the six, where he coolly converted to put his squad ahead. While the Riders looked to uncover another equalizer, their search was rudely halted by a moment of brilliance from Valencia in the 79th minute. The Lowell midfielder grabbed a pass from Alexander Carvajal and unleashed a long distance shot that smacked the bottom of the bar before crashing into the back of the net. Lowell will return to the pitch on Sunday, Apr. 6 when they take on the Boston Ethiopians at Lawrence Veterans Memorial Stadium in Lawrence, Mass. Kickoff is set for 4pm. Actually GLUFC returns to the pitch on Saturday April 5th to start off in the BSSL. They have a McKenzie Cup play-in game that day vs fellow Div3 team OHP Gunners. Hey Logan, it’s funny – we originally posted the 5th as their next game, but we received a fb message from one of their co-founders saying it was the 6th. We’ll try to get it straightened out! Brian – the team discussed in the article (MSSL) will play on the 6th. Their other team (BSSL) will play on the 5th. Not sure how many players will appear on both teams, if any. Our club has about 60 players. Until our NPSL season starts in May, there will be fluidity among the BSSL and MSSL squads… We’re using those games as our PRESEASON. Guys will be bouncing around. Mostly, the NPSL level players will see action in our MSSL games for now. Since, we have players from 16-33, our 16 year olds can only play in the MSSL and it’s 17+ for the BSSL. Our average age is 25. None of our rosters are set in stone and won’t be until May 10th. Everyone in our club has the chance to use these games and trainings to prove themselves.